For Christmas, I received Top Pot Hand-Forged Doughnuts: Secrets and Recipes for the Home Baker by Mark & Michael Klebeck with Jess Thomson - I think it might have been a not-so-subtle hint from my brother-in-law that doughnuts would be a good next step in the culinary world. I took the hint and excitedly obliged! This book is awesome! 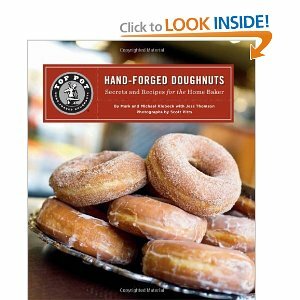 It contains history, tips, recipes, and more for the famous doughnuts made by Seattle bakery Top Pot. My kids were more than a little excited to see a doughnut book in the mix of my Christmas books and my three-year-old immediately started picking recipes for me to make. The pictures are beautiful and inspiring and the recipes are detailed and specific. It is thorough and even includes gluten-free doughnut recipes. The book also provides many glazes and icings so you can mix and match your doughnut and topping. Really I just can't get enough of this book and it's not helping my healthier eating January. So...I'm going to also give you a yummy reason to break those resolutions for just one day...or two...at a time (ha!). If you like to cook and bake and enjoy trying new techniques, this book is definitely for you - go pick up a copy! It's SO fun! I made the Pumpkin Old-Fashioned Doughnuts and the Sour Cream Old-Fashioned Doughnuts - they were both excellent and I can't wait to try another flavor. Today, I will share one recipe from this great book and you go buy the book and get the rest - you won't regret it and you will definitely want to make all of the different kinds! Oh and don't foget to drop off one of your delicious doughnuts for me to try! Seriously, these are SO GOOD! My family (parents, sister & bil, husband, kids, etc) LOVED them! I'm totally a sucker for pumpkin so these were the first ones I made and honestly, they exceeded my already high expectations. I followed the instructions exactly since I've never made doughnuts and they turned out picture-perfect. To make the doughnut dough: Sift the flour, baking powder, salt, nutmeg, and pumpkin pie spice together into a medium bowl, and set aside. In a stand mixer fitted with the paddle attachment, mix the sugar and shortening/vegetable lard for 1 minute on low speed, until sandy. Add the egg yolks, then mix for 1 more minute on medium speed, scraping the sides of the bowl with a rubber spatula if necessary, until the mixture is light colored and thick. Add the dry ingredients to the wet ingredients in three separate additions, alternating with the sour cream and pumpkin, mixing until just combined on low speed and scraping the sides of the bowl each time. The dough will be sticky, like wet cookie/biscuit dough. Meanwhile, make the pumpkin glaze: Place the confectioners'/icing sugar, corn/golden syrup, salt, pumpkin pie spice, pumpkin, and vanilla in the work bowl of a stand mixer fitted with the paddle attachment. With the machine on medium speed, add the water in a slow, steady stream, and blend until all of the sugar has been incorporated, scraping the bowl a few times if necessary. Set aside. Using a candy thermometer to measure the temperature, heat oil (at least 2 in deep) in a deep fryer, large pot, or high-sided frying pan to 325°F. Roll out the chilled dough on a generously floured counter or cutting board to 1/2 in thick, or about 8 inches in diameter, flouring the top of the dough and the rolling pin as necessary to prevent sticking. Cut into as many doughnuts and holes as possible, dipping the cutter into flour before each cut. Fold and gently reroll the dough to make extra holes (working with floured hands makes the dough less sticky), and cut again. Shake any excess flour off the doughnuts before carefully adding them to the hot oil a few at a time, taking care not to crowd them. Once the doughnuts float, fry for 15 seconds, then gently flip them. Fry for 75 to 90 seconds, until golden brown and cracked, then flip and fry the first side again for 60 to 75 seconds, until golden. Transfer to a rack set over paper towels/absorbent paper. 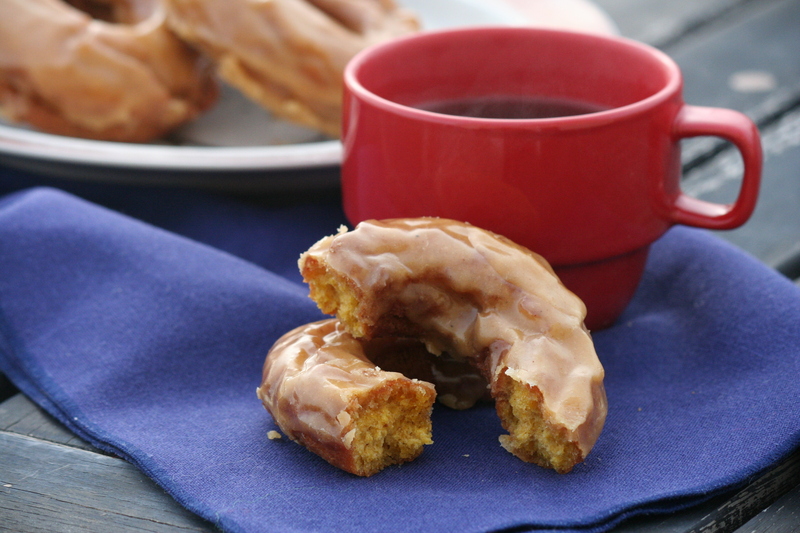 While the doughnuts are still quite hot, dip the side with the deepest cracks on each into the warm Pumpkin Glaze. Let dry on cooling racks, glazed side up, for about 15 minutes. * This dough was not as sticky as I expected and was easy to work with - I did use regular all-purpose flour (sifted) but that isn't as light as cake flour so that may have contributed to the less stickiness. * Keeping the oil at a consistent heat (between 325-350) was sometimes challenging and I accidentally added a couple of donuts too early which made them take longer or cook too fast and made the end product not quite as good but nobody complained and there were none left! * I kept the glaze warm (which makes glazing easier) on my warming burner on the stove (low-medium). * These were best the first day but still quite excellent the next day. 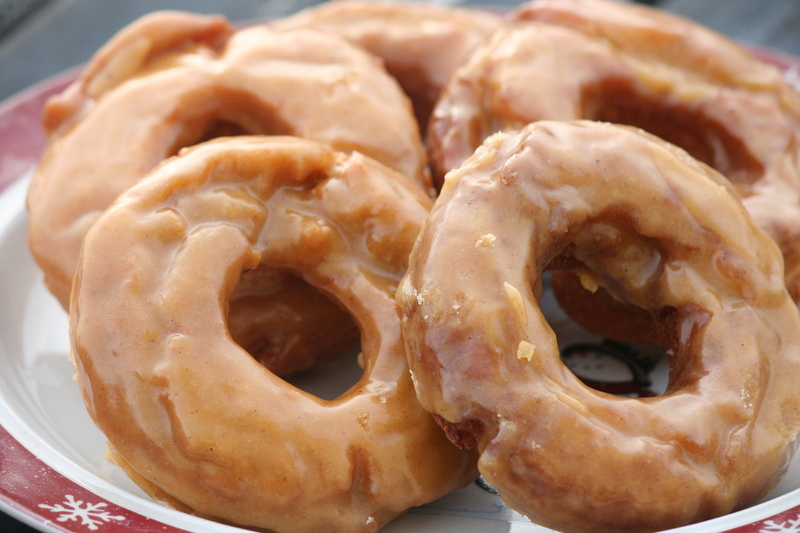 * I was not compensated in any way for this review except for getting to share and enjoy delicious, homemade doughnuts. Check out our other pumpkin recipes! I love this blog site layout ! How was it made? Its rather sweet.